UPDATE: 6/1/2016 – To stop the flickering in chrome run chrome non-maximized. Fixes it. ‘Fix’ is in the google chrome bug report on this issue. Hopefully they fix for maximized too, but good enough for now. UPDATE: 4/30/2016 – With 16.04 released my results have been solid. I’ve had issues where if plugging in the USBC cable didn’t work I could unplug POWER from the laptop and then retry and it would work … but I haven’t had much of that anymore either. It seems this ‘use case’ is stabilizing and mostly reliable. I do see screen flickering at times especially when flash/html5 video is playing through chrome, but I noticed that on my System76 Galago UltraPro as well so I’m guessing this has to do with an X driver issue and nothing specific to the XPS 13. Looks like this laptop is only getting better with age. If you’ve followed my Dell XPS 13 9350 installation guide and have the 4.4-rc7 kernel running, you know that most things are running pretty well for me. One thing that the new XPS 13 has (which is very cool) is USB-C. The downside is that there’s no displayport, and no other ways to get video out. I took a chance and bought this USB-C to DisplayPort adapter from amazon and hoped for the best. Lo and behold, opened it up, plugged it in (side note: make sure you push it in until it ‘clicks’) and bam … my Dell UltraSharp U2715H poppped up like a champ and worked right away – note this is at 2560×1440 resolution. I love ubuntu and this laptop! I recently purchased the Microsoft Sculpt Ergonomic Desktop (link goes to keyboard only, I purchased with the mouse as well) and wanted to post my thoughts about it. Previously I had the wired keyboard from work and I really liked the keyboard a lot. It took some getting used to initially to break myself of a few muscle memory finger miscues but once I was over that (fairly quickly) I really appreciated the comfort of the keyboard on my wrists. I had heard good things about the wireless variant and asked Santa for this setup for Christmas in 2015. The keyboard has a feeling similar to a chiclet keyboard on any modern laptop, The key travel is very comfortable for each of the keys. Compared to say, my Dell XPS 13, the travel is probably double the distance which makes for a very comfortable typing experience. I LOVE that there is a switch to toggle between the function keys and multimedia keys, this makes it VERY convenient to switch between being able to do actions such as turn volume up/down and switch back to the Fn keys for debugging in IDEs (a very important detail if you are a programmer). 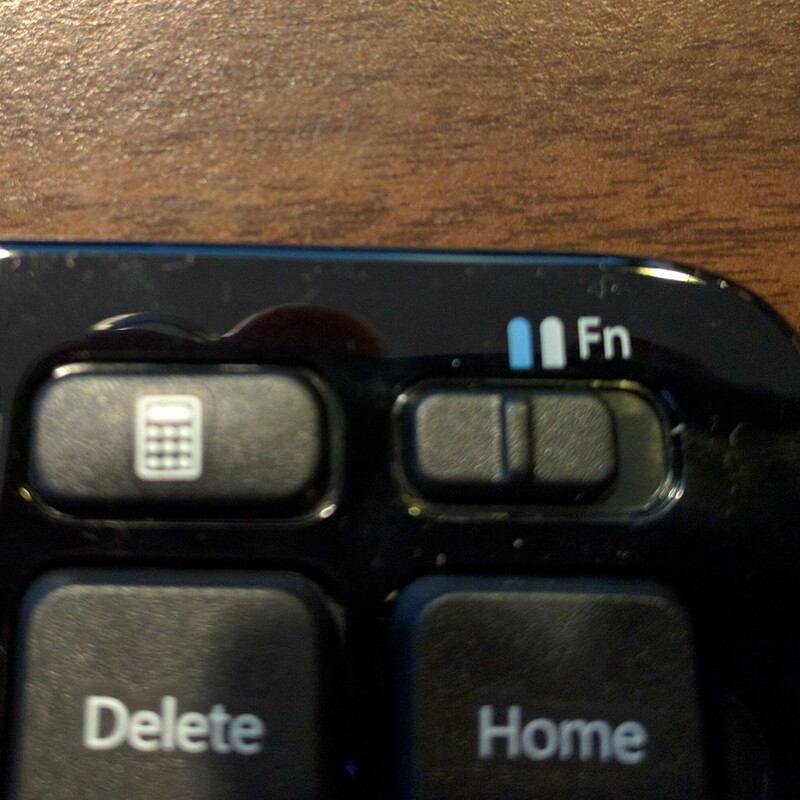 For some, I’ve heard complaints about the Fn keys because they are half-size (as shown by the calculator key below), but for me this isn’t a big deal. The keyboard design is very modern looking and attractive (in my opinion) with the hollowed out area under the keyboard, much more so than the old wired variant I had which was a solid chunk of plastic. The plastic used for the wireless variant is a very premium feeling plastic, nothing about any of it feels cheap. The mouse is another story. I find the design very odd. It feels like I’m holding a baseball and it actually seems non-ergonomic to me. It doesn’t BOTHER me per-se because I’m not usually on the mouse nearly as much as the keyboard and I’ve never had issues with that hand/wrist, but the feel of the mouse is just a bit odd. I wouldn’t bother getting a different mouse and filling another USB slot for the connector (or using bluetooth to attach/detach to it), but it’s just a very weird feel to me. I’m pretty good as just dealing with things though, so for me this isn’t a deal breaker at all and I’m content to just live with it but it is something that did strike me as much less impressive versus the keyboard itself. For a programmer or anyone looking for a quality ergonomic keyboard I think Microsoft has nailed it yet again. They consistently deliver quality hardware and this is no exception. The desk space required for the keyboard is minimal (I rarely ever use a number pad which is a separate piece) and the look is all class. If you are in the market for this keyboard, don’t hesitate – it’s a great piece.